The Green Dream rosin press is an electric rosin press that can produce very high-quality rosin without any effort. 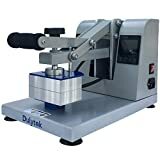 Electrical rosin presses are relatively new on the market, and they have been gaining more and more popularity due to their excellent features. An electric rosin press does not require any external pumps or compressors in order to work properly. The Green Dream electric rosin press is ideal for larger batches. The Green Dream rosin press comes with dual heating plates, and the temperature range is between 0 to 482 degrees Fahrenheit. The heat plate’s size is 6 x 8 inches. You have to be careful with adjusting the temperature because it differs depending on the material that you are pressing and the kind of result you want to obtain. If you plan to achieve better consistency rosin, it’s best to use temperatures between 160 and 190 degrees Fahrenheit and to let the material be pressed for 1 to 5 minutes. If you want to obtain an oily consistency, it’s best to press the cannabis material at 190 to 220 degrees Fahrenheit for 45 seconds to three minutes. 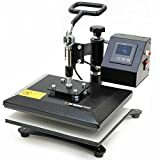 This electric rosin press comes with an LCD that shows the user all the necessary information regarding timing, temperature, and pressure as well. The Green Dream electric rosin press does not require any additional compressors or external pumps in order to be able to function properly. All this machine needs is an electrical outlet to plug it in, and it will be ready to do all the extraction work. This electric rosin press comes with a voltage of 110V/220V. 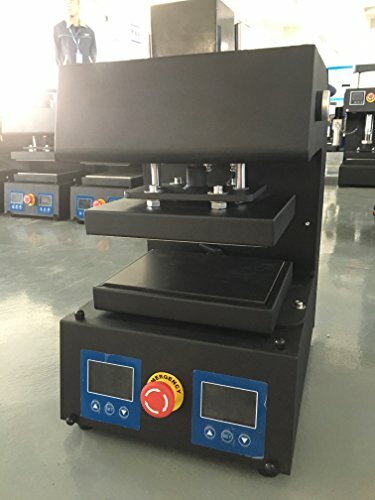 The heating style of the Green Dream rosin press is purely electric, and the machine uses the latest generation electronic technologies and more substantial pressure compared to other similar rosin presses. 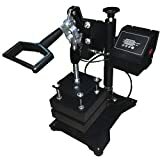 The first thing I noticed was the overall build quality of this electric rosin press. 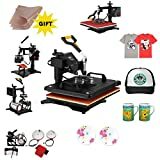 I wanted a high-quality electric rosin press because they are much easier to work with and such a machine will definitely help your home business. The Green Dream electric rosin press is extremely compact, and its design is also really trendy with its mixture of black and red. The whole machine really seems very solidly built, and the construction is steady. My only complaint about it when I first opened the box was the fact that it lacked more detailed instructions. It included a few notes but not nearly enough especially in the primary operation department. This is the reason for which it took me a bit longer to learn how exactly everything works with this electric rosin press, but I figured things out eventually. The plates work smoothly and when the flower is squeezed the pressure remains the same, and this is very important for the final result. It’s also important to know that flower rosin requires more pressure than hash rosin to squeeze the juice out and there are some presses on the market that apply too much pressure. This one managed to apply the exact amount of pressure to get the results I was looking for. The ideal pressure range for flower rosin is somewhere between 550 and 1,500 PSI. the fact that the pressure and the heat were distributed evenly was really important for me. In case you didn’t know, if the pressure is applied too fast then you might have a blowout. On the other hand, if you apply the pressure too slowly, the result will be overexposure of the material to the heat plates, and it will eventually get degraded. Such a thing has never happened with the Green Dream electric rosin press, and I was delighted to see this. I used it about ten times until now, and I was delighted with the results every time. I also liked the fact that this electric rosin press was manufactured with the user’s safety in mind and this is a thing that must really be appreciated these days. When you are operating such machines that are capable of exerting thousands of pounds of force, it’s usually a great idea to adhere to safety standard and the best practices. This one is definitely a high-quality rosin press, and it involves minimum risks. It comes with built-in safety features that are able to prevent accidents from happening. I also like the fact that I was able to extract a couple of batches at a time and this obviously same me lots of effort and time. 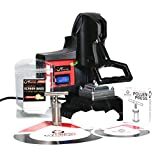 I would recommend this rosin press for cannabis enthusiasts who are interested in producing a more significant quantity of rosin at once. 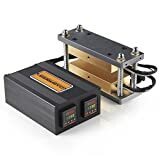 The dual heating plates of this electric rosin press provide a high pressure of up to 20,000 PSI. The LCD panel comes in handy for letting you know the essential data regarding temperature, pressure, and timing. The press machine comes with lifetime support so you don’t have to worry about potential problems because they’ll be solved with the manufacturer’s help. The Green Dream electric rosin press does not come with very accurate and detailed information about the products and its use, but you can get in touch with customer support, and you will find out everything you need to know. The Green Dream electric rosin press comes with two years of warranty for the main body of all the machine including the filling machine. According to the manufacturer, you will get lifetime technical support for your order as well. The Green Dream electric rosin press uses the latest generation electric technology to produce high-quality rosin. The press machine is best suited if you are interested in pressing larger batches of cannabis material. The rosin press uses high pressure and controlled heat to get the best outcome and to provide you solvent-less rosin for your needs and for sharing it as well. The Green Dream machine will allow you to make clean and delicious results without any aftertaste.